Here’s some stellar work by Brazil studio Quadradão. The work definitely has a nice authentic feel that reminds of some of the great classic pieces from the 50s and 60s. Are projects by “Build”? “Experimental Jetset”? “AisleOne”? Some graphic school somewhere in the world? The Old-New global graphic taste (take a Grotesque, write some alphabet, leave a lot of white and feel cool and swiss) is going to mixing people! Experimental Jetset comes to mind, definitely. Maybe a little too much? I mean, ExJet’s work is so sublime and unique to them that when something similar is tried by others (out of inspired flattery, I’m sure) it runs the risk of looking like encroachment somewhat. Really I think it’s being a bit harsh when people automatically compare every piece of current modernism to Experimental Jetset. 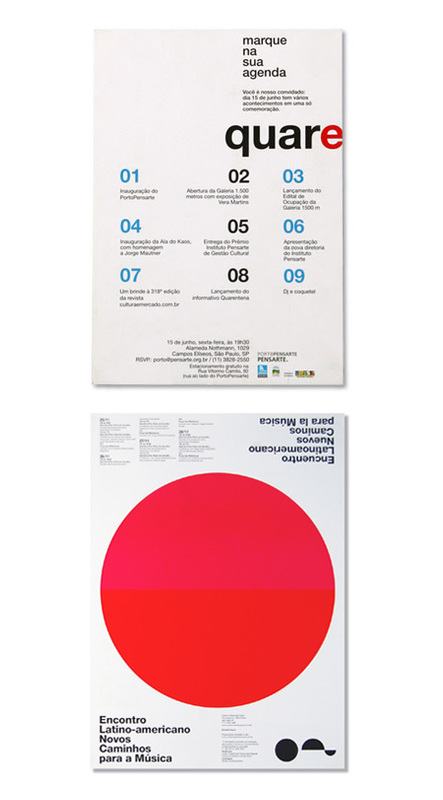 Whilst Quadradão (as well as many others) share a similar aesthetic quality to Experimental Jetset I think it comes about through approaching graphic design from the same school of thought rather than merely trying to imitate a particular look. I don’t want to try speak for either of the two studios but many of those who embrace modernism and the ideas that it puts forward are ultimately going to share a common thread among their work. I agree with Jeremy. I don’t think these other companies are ripping off EJ, they just produce work with a similar aesthetic because they all follow the same design principles. Experimental Jetset are NOT the fathers of modern design, for luck! Every body/every designer has a visual background, it’s inherent, like tastes.. I can do something and maybe there are pieces done before similar to mines.. but I don’t saw it never this piece. We all live in the same world and learned the same history, and possible we all have the Phillip Meggs book recommended from our teachers..